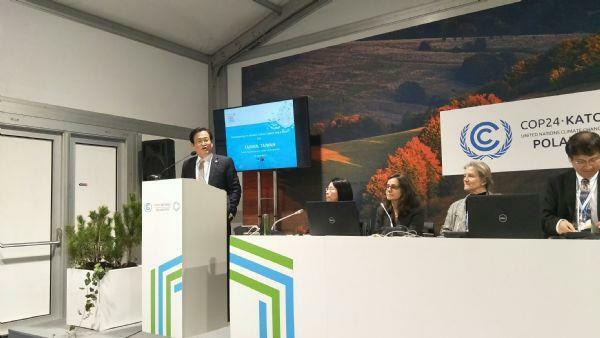 Tainan City Government Deputy Secretary-general Lee Hsien-wei led a delegation to Katowice, Poland, to take part in the "Multi-Stakeholders’ Adaptation Action to Respond to Climate Vulnerability", a side event of the UN Climate Change Conference December 2018 (COP 24). During the session, which was organized by Green Club and Université Cadi Ayyad (UCA), Tainan City shared its experience and achievements in promoting smart city policies. 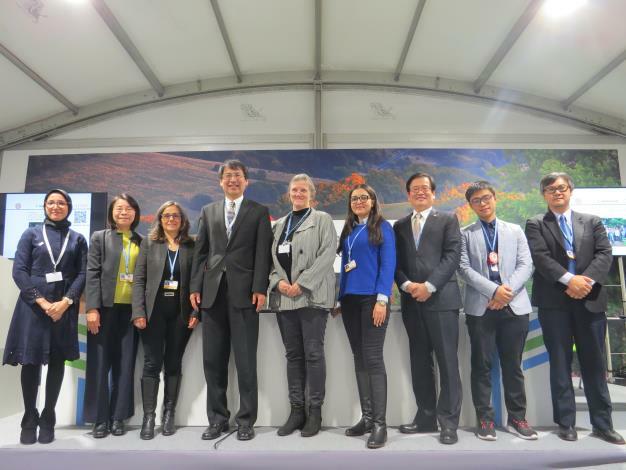 In addition, Tainan also presented its experiences in developing other areas, such as solar power, smart city, low-carbon industries, and sustainability, at the booth set up by the Foundation of Taiwan Industry Service during this international conference held between December 3 and 14. The displays were well-received by other participants. With “Turning an Ancient Culture Capital into A Smart City” as the theme, Deputy Secretary-general Lee shared the development process and highlights of Tainan's smart city transformation. The video clip, "Tainan smart city comes from love" , which he also showed during the presentation, generated a round of applause. Lee talked about the six main areas of Tainan's smart city transformation: smart healthcare, smart education, smart tourism, smart transportation, smart flood control, and smart control centers. The city government actively leverages open data and big data analyses to effectively solve problems and provide more user-centric and smarter services. By emphasizing on Sustainability, Mobility, Accessibility, Renovation, and Technology, Tainan aims to set up a SMART environment for its residents. Lee also mentioned that due to global climate change, Tainan is now more susceptible to flooding and epidemics such as dengue fever. Therefore during the city's smart city transformation, the government leveraged numerous technologies for urban disaster prevention, and deployed a wide array of new equipment and systems to help mitigate disaster impact and adjust strategies to combat new situations triggered by climate change. Tainan City also employs technologies in other areas, such as data integration, application improvements, new phone apps, big data for traffic analyses, real-time remote healthcare services for rural area residents, and UAVs to monitor bridge conditions. Relevant government agencies use new technology to monitor drainage system water levels during heavy rain and typhoons, and leverage open data to set up an epidemic prevention map to prevent dengue fever outbreaks. 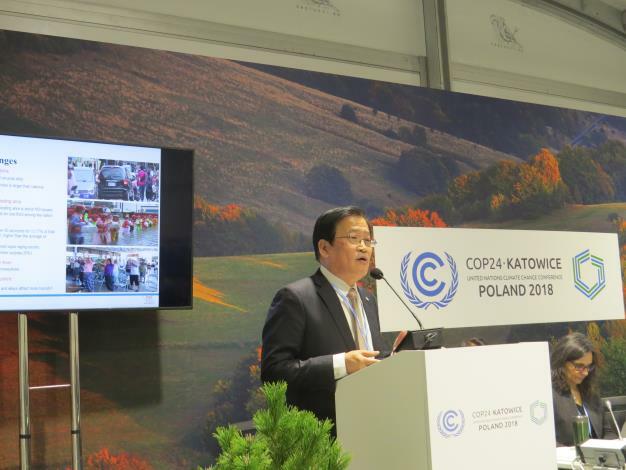 Tainan City also shared its achievements in establishing a smart city and promoting renewable energy through video clips and flyers at the venue. These achievements include a 95% broadband coverage and over 20,000 beacons deployed across the city. Furthermore, Tainan has seen fruitful results in promoting renewable energy. The city offers a complete green industry chain and is a major base for domestic solar energy battery manufacturing. Starting from 2011, the government rolled out the Solar City Project, which has generated 668 MW of electricity by the end of October, 2018. The annual generated amount is 880 million kWh, which can supply the electricity demand of 24,000 households in Tainan for a year. Tainan expects to reach its 1 GW goal in 2021. This amount will supply 36,000 households, which is over half of the households in Tainan, for a year. As the Deputy Secretary-general expressed at the event, it is crucial for every global citizen to pitch in and help mitigate global warming immediately. Rolling out smart city policies can not only offer residents a more convenient lifestyle, but also help Tainan become a more resilient city that can intelligently adapt to moderate climate change.